If you have any further resources or ideas for classroom economy, please add them here. 1. Create a list of potential jobs, or ask students to help brainstorm a list of necessary jobs in their classroom, with specific job descriptions. 2. Set an income for those jobs, or have students set the salaries based on which jobs are more deserving (have more responsibilities) for higher incomes. 3. Have students formally apply for their desired jobs. This can be done through a formal application, or students can write a persuasive text. Encourage students to apply for more than one, or make a top-three list, in case there is high demand for a position. This is a great way to teach probability and diversification. 4. Introduce concepts of taxation, real-estate costs (classroom seat locations), government assistance, volunteer stipends and fines as desired. The goal is to try to make the experience as real-world and complex as possible, to open up tensions and internal conflict with decision-making. 5. Students start their jobs and get paid once a week or every two weeks. If there are students who are not doing their agreed upon job, they may be warned at first, and then released of their duties. This would put them on unemployment and then open up the position for anyone who wishes to fill it. 6. Students can either choose to rent their seating area, or eventually buy it. Some may then choose to rent that space out to garner extra income. 7. Students can also invest their money in the "stock market," with different levels of risk involved in each stock. 8. Students can also choose to spend their money on immediate wants, which can be offered through a class store. 9. Classroom economy may be done over the whole year, a semester or during a unit. Prices should be adjusted according to the time of experience. 10. Teacher-created tensions can always be thrown in to make it as life-like as possible, depending on the goals of the experience and curricular tie-ins: stock-market collapse, unemployment is rising, wealth gap increases, corporate or bank fraud, etc. 11. 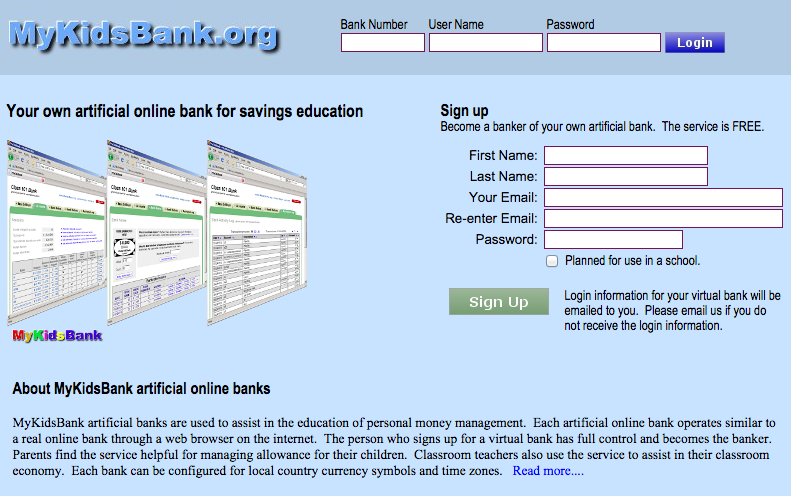 Finances can be kept using hard currencies or tracked online through mykidsbank.org. Keep track of accounts online.